The site of the courthouse square has remained constant since the town was laid out in 1841. 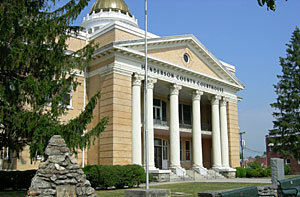 The gold-domed Neo-Classical Revival courthouse, begun in 1904 and completed in 1905, replaced a two-story stuccoed brick structure which had been one of Hendersonville’s earliest buildings. In 1903, the county commissioners deemed the old courthouse inadequate and appointed Frank P. Milburn as architect for a new courthouse. However, they rejected Milburn's plans and accepted instead the plans of Richard Sharp Smith. R. S. Smith, an Englishman, had come to Asheville to supervise construction of the Biltmore House. After the death of Richard Morris Hunt, the architect of the Biltmore House, Smith served as Vanderbilt's resident architect. The contractor was local builder and architect W. F. Edwards. 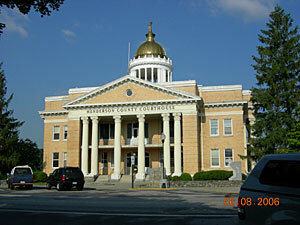 The most notable feature of the three-story brick courthouse is the gold domed three-stage cupola, which consists of a columned drum and domical roof, crowned by a statue of Athena. The rectangular building has front and side entrance pavilions, a pedimented hexastyle portico with Corinthian columns at the main entrance, and tetrastyle porticoes at the sides. The interior is finished simply with gray granite floors and brick wainscot. The courtroom has been remodeled. On the whole, the relative sophistication and grandeur or the courthouse seems a reflection of the aspirations of a small county seat whose economy was booming and whose population was beginning to soar.